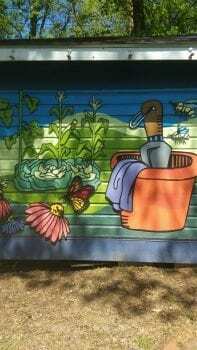 The children at the YMCA have kept the garden they planted a few weeks ago weeded and watered. They have picked yellow crookneck squash, eggplants, cherry tomatoes, bell peppers and dill. The pole beans they planted are not big enough to harvest yet. 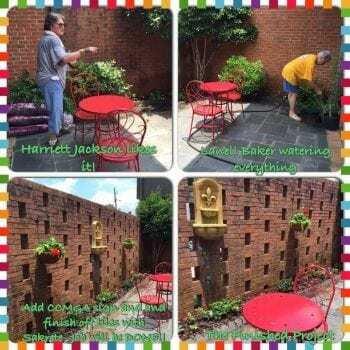 When Harriett Jackson was there recently, they had vegetables in the kitchen to prepare and cook so they could taste what was grown in their garden. 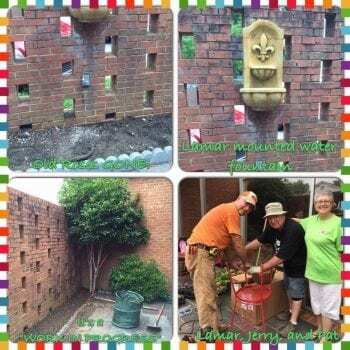 The Master Gardeners that worked with the children on this project were Pat Farmer, John Wallace, Joyce Lawson, Jackie Hickman, Robin Cagle and Harriett Jackson. 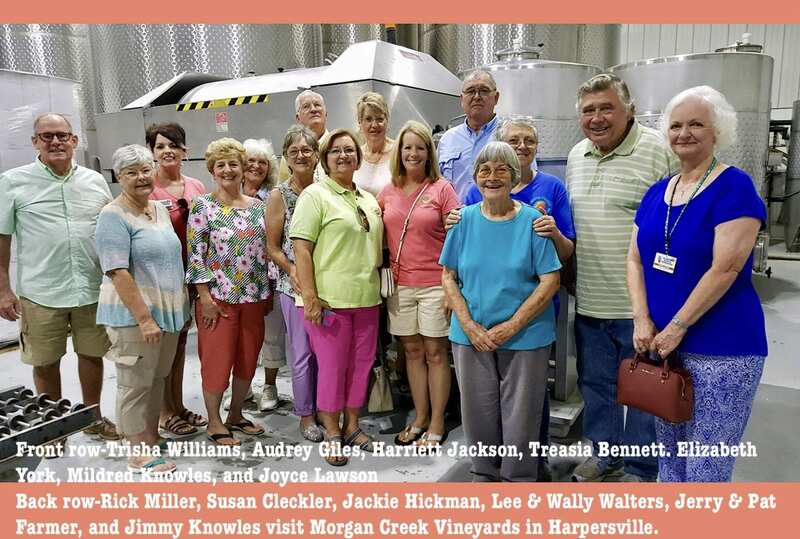 A tour of Morgan Creek Vineyards was a great way for Chilton County Master Gardeners to spend a hot summer day on Friday, June 29th. 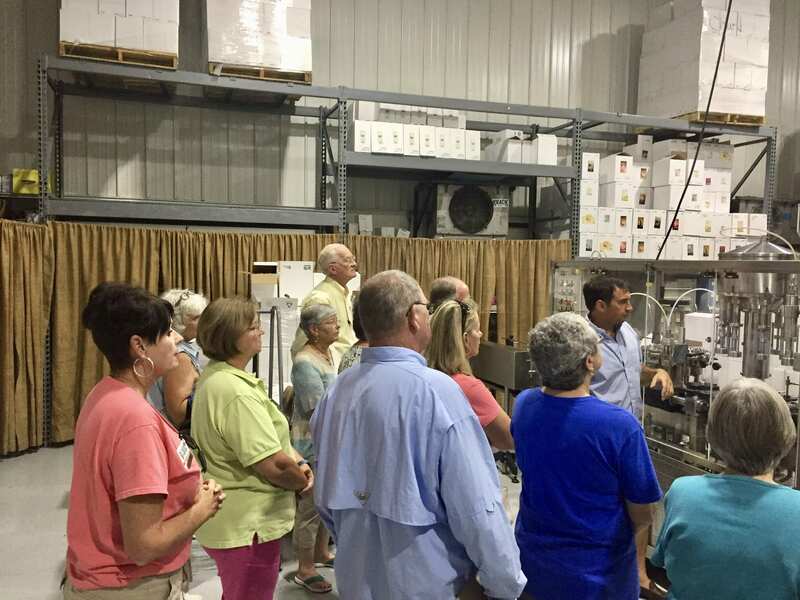 The family-owned winery located in Harpersville, Alabama specializes in muscadine and fruit wines that range from dry to sweet. 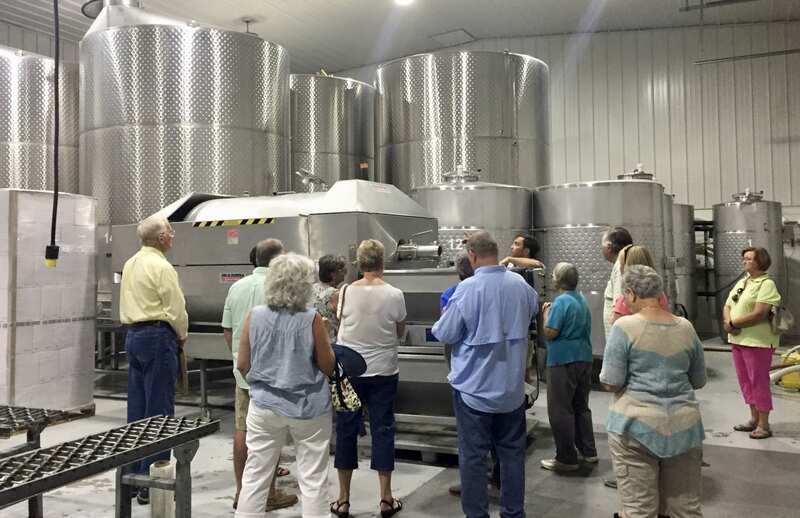 Charles Brammer, Jr, son of owners Charles Brammer, Sr and Mary Brammer, explained the process of making wine from harvest through bottling. He told us of the few insect problems and how they are controlled. Although they purchase most fruit from large growers they do have muscadine vines and blueberries on the property. Following our tour our gracious hostesses served samples of eleven wines — dry, semi-sweet sweet and fruit. After the tasting several members went to Trisha Williams’ with their sack lunches and toured her garden. 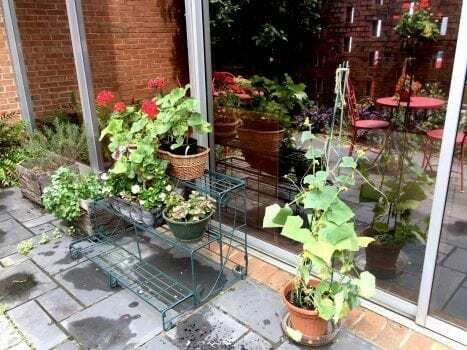 Trisha and her husband, Jackie, have a beautiful backyard with many large old trees, flower beds full of daylilies and other perennials, raised beds full of asparagus, and a vegetable garden with pole beans, squash, cucumbers, tomatoes, and much more. 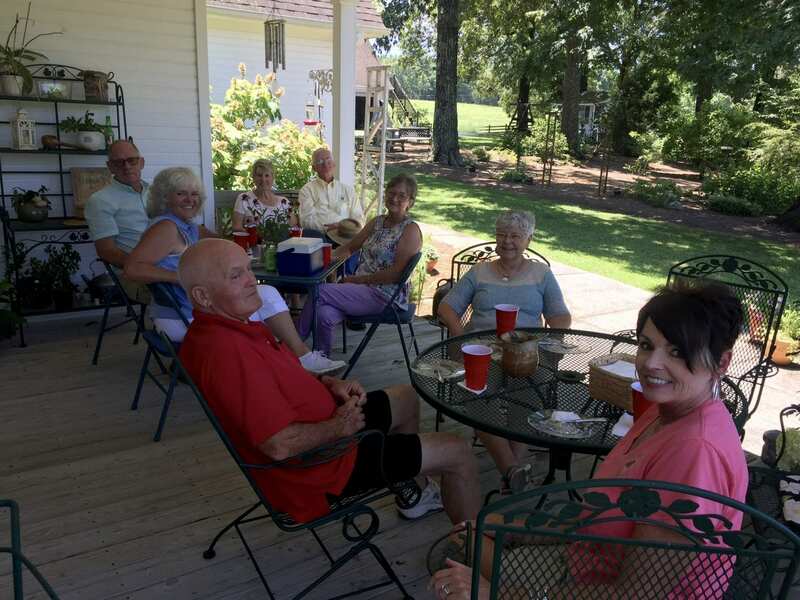 Thank you, Trisha, for providing us with a cool porch, ice tea, and your Heavenly Cake dessert after our tours! 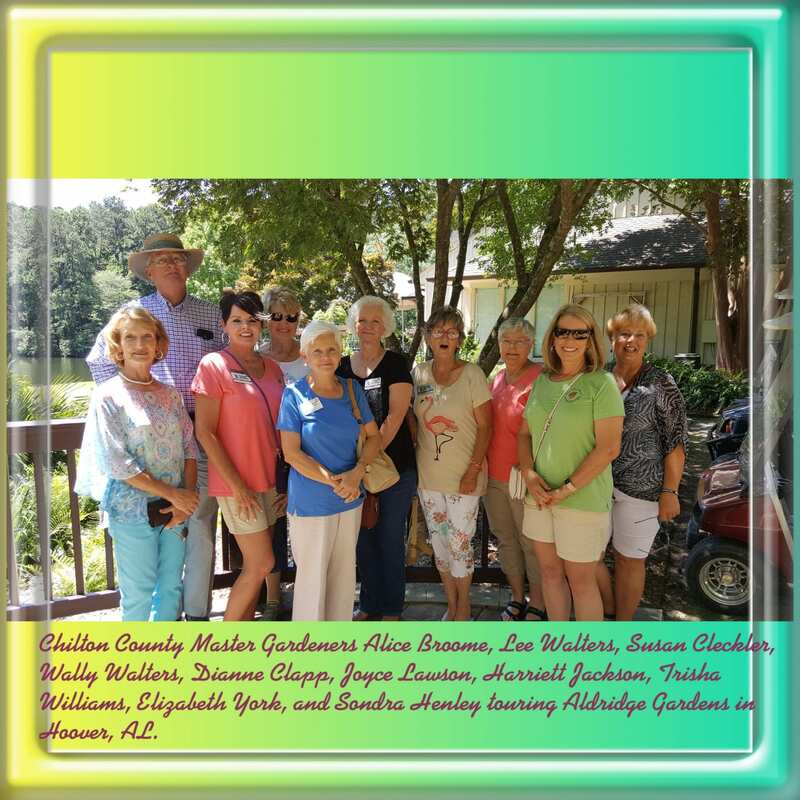 David Doggett, Jefferson County Master Gardener and volunteer docent at Aldridge Gardens, led a walking tour of Aldridge Gardens in Hoover for a group of Chilton County MGs on June 4. It was a perfect day and most of the hydrangeas were at peak bloom. 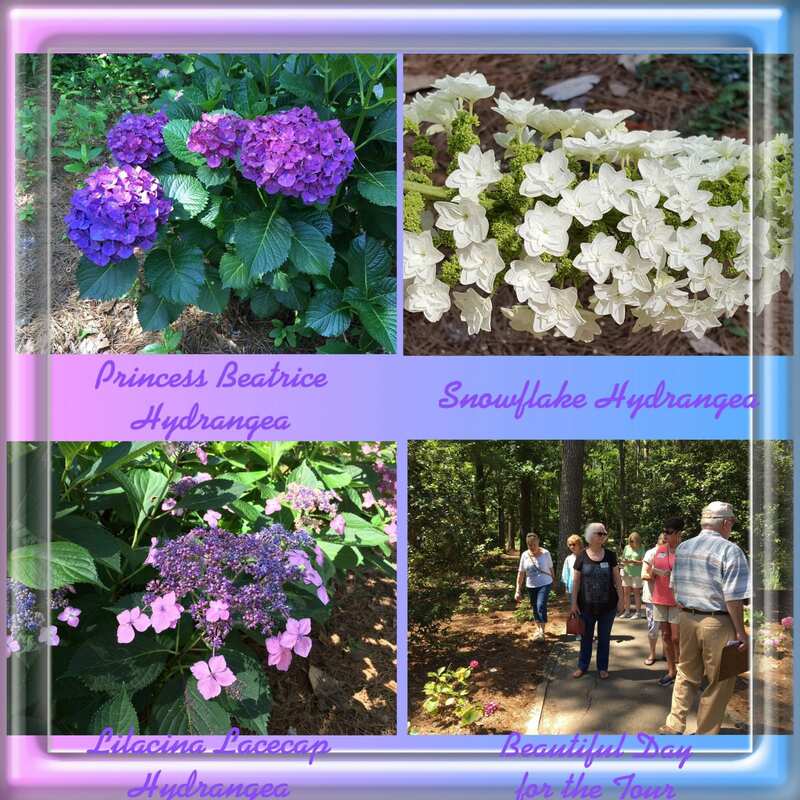 We learned the history of the property and garden as well as much information about the many varieties of hydrangeas in the gardens. David told us of the discovery in Alabama of “Snowflake”, “Harmony”, and “Gatsby” varieties of oakleaf hydrangeas. 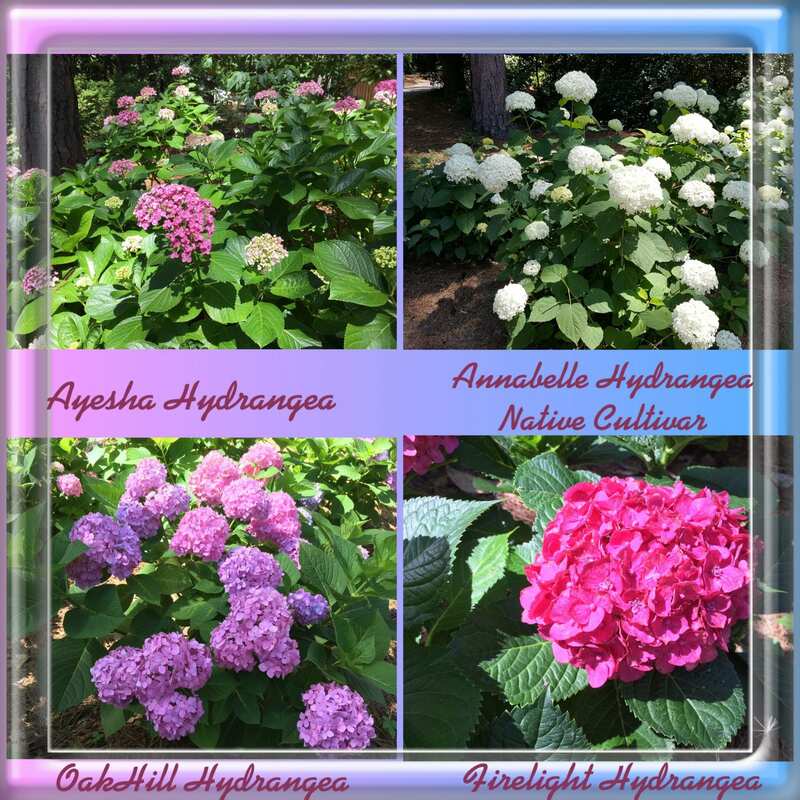 Aldridge Gardens has a great collection of mophead and lacecap hydrangeas in a variety of colors including blue, purple, pink, dark pink and white. Although they are known for hydrangeas, don’t miss the daylilies, Japanese maples, and many other plants in the garden. 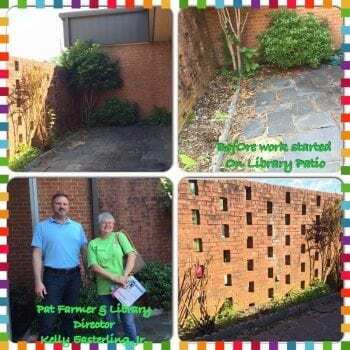 In the spring of 2015, one of the Master Gardeners was approached by some of the library personnel about redoing the landscape of the library patio. The request was voted on by the Board and the work was done. Several members helped with the work. 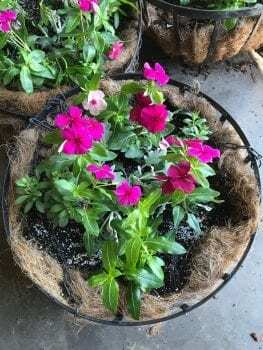 Also one member donated flowers she had started from seed, and another bought and donated a wall water fountain for the patio. Recently I went by and checked on the outdoor reading room (that’s what they call it). I’m happy to say all was alive and well! The fountain was working with water flowing through it. There were 2 hanging baskets of blooming red geraniums and pots of red begonias on the tables. I found out there is a volunteer from Maplesville who donates her time one day a week. 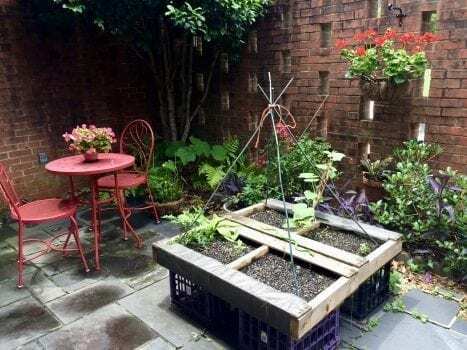 She has added a raised bed for vegetables and pots of tomatoes and cucumbers. My hat’s off to all the ones who have made good use of the outdoor reading room. It looks great! Below are NOW (top photos) and THEN photos. 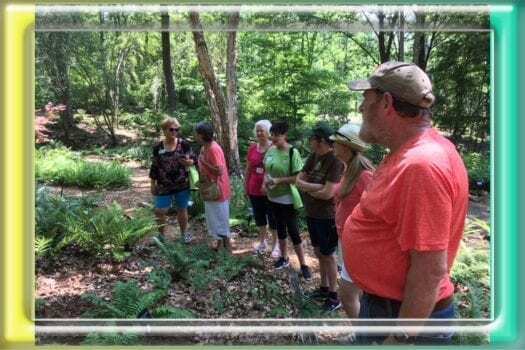 Birmingham Fern Society members, Ken and Alicia Hall, led a tour of the Birmingham Botanical Gardens’ Fern Glade for a group of Chilton County Master Gardeners on May 14. 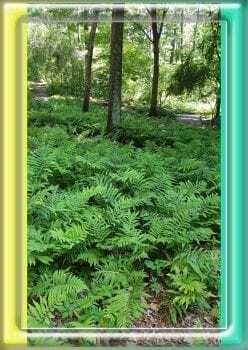 One area of the glade is devoted to native Alabama ferns and other areas showcase ferns from various places. 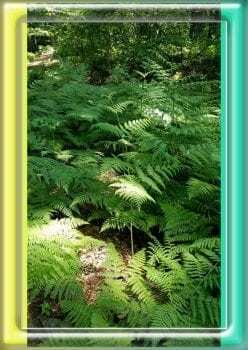 We learned about many varieties of ferns and how they multiply by spores or stolons. Ken collects spores and fronds from certain varieties and sends them to a nursery in Texas for propagation. 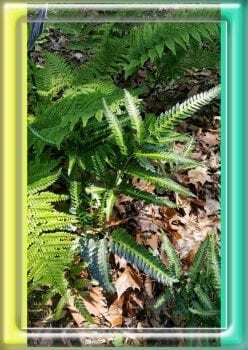 He and Alicia told us how they create micro climates for ferns that need special growing condition. 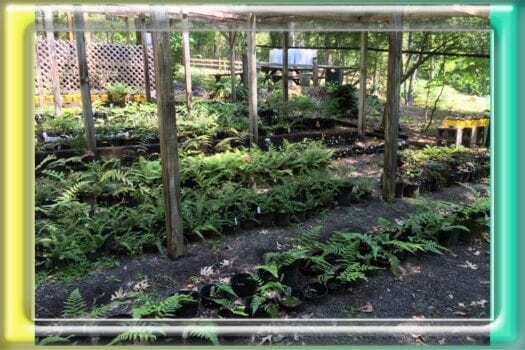 They also showed us through the fern nursery where plants are grown for the gardens as well as for the BBG Plant sale and the Fern Society sale. Thank you Ken and Alicia for sharing a wealth of information! Members attending were Susan Cleckler, Elizabeth York, Trisha Williams, Joyce Lawson, Harriett Jackson, and Sondra Henley. Photos by Trisha Williams and Susan Cleckler. 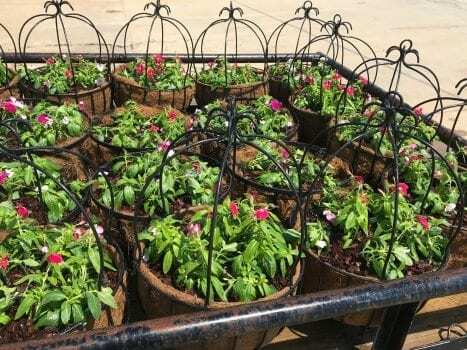 Master Gardeners planted 55 baskets and 22 planters for the City of Jemison on Thursday, May 10. Over the course of 2 days, baskets were lined and plant material was divided along with the planting of the flowers. 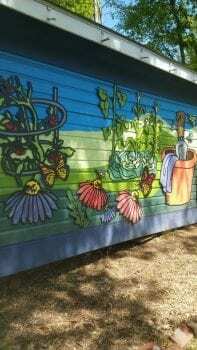 Master Gardeners Diane Clapp, Alice Brooms, Robin Cagle, Debbie Housner, Rick Miller, Alan Reed, Lee and Wally Walters, Harriett Jackson, Linda Hays and Sondra Henley were the worker bees for this spring project. Photo by Robin Cagle. 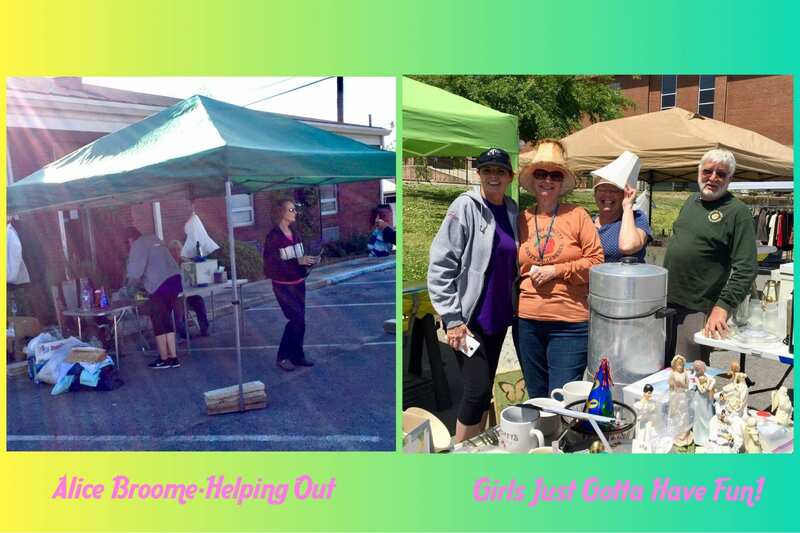 The Chilton County Master Gardeners had their first yard sale/plant sale on April 21 at the Chilton County Extension Office parking lot. We had been cleaning out and collecting items for months. Thank you to all who donated items for this event, it was a huge success! 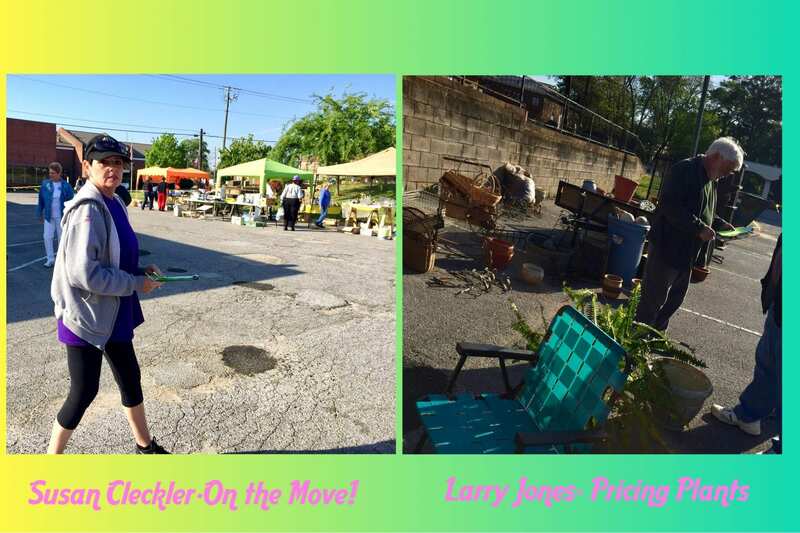 We sold clothing, books, tools, glassware, furniture, garden items, Hypertufa planters made by the Master Gardeners and filled with succulents, and of course, plants! 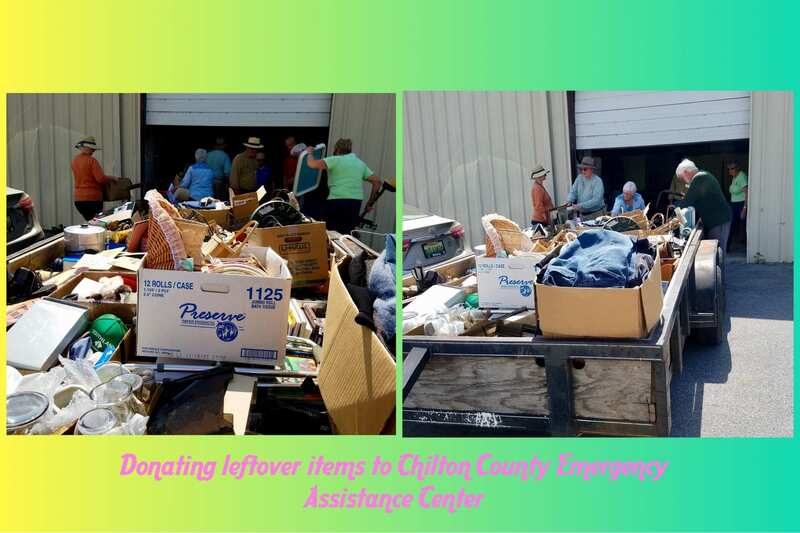 After the sale, we donated all the items that were left to the Chilton County Emergency Assistance Center. 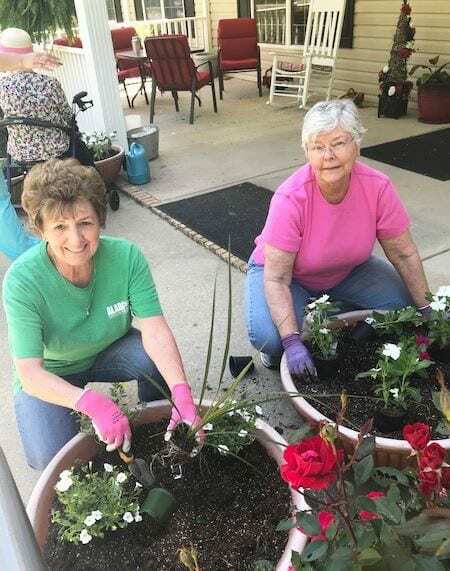 The Gardens of Clanton Assisted Living facility approached two Chilton County Master Gardeners for advice and assistance on planting annual pots for the entrance and front porch and an existing vegetable bed and pots on the back patio. 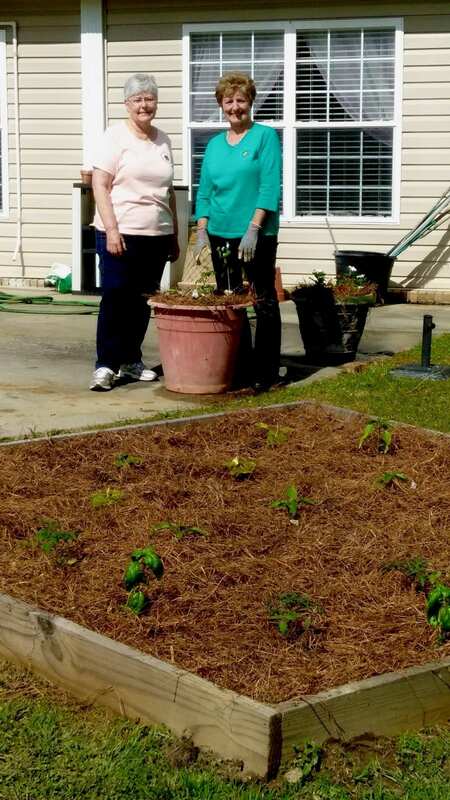 The Gardens obtained donations of annuals, vegetables, and herbs and provided potting mix and pine straw. The entrance pots were planted with vinca, calibrachoa (million bells) and ornamental grass. 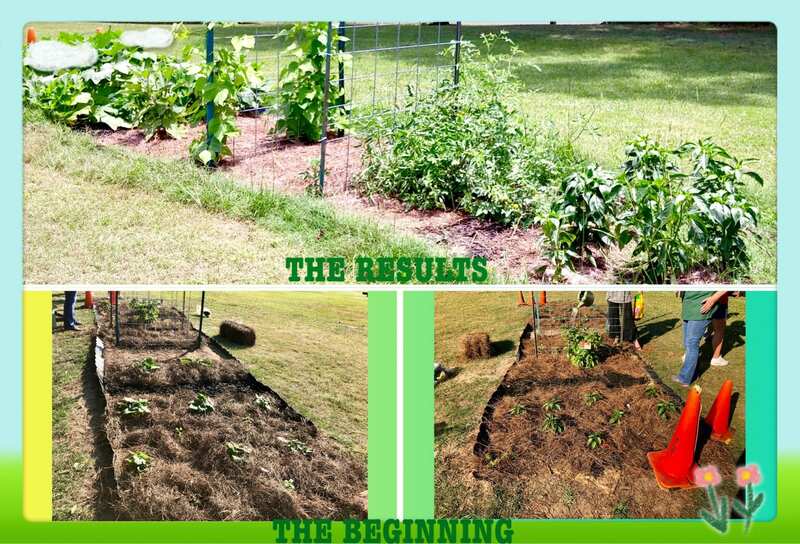 Tomatoes, yellow squash, bell peppers and sweet banana peppers, radishes and basil were planted in the existing 8×8 vegetable bed after it was weeded and amended with compost. 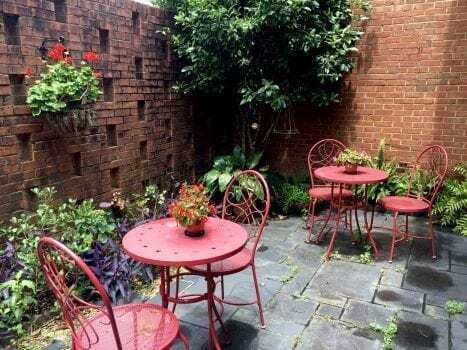 An herb pot with flat leaf parsley, oregano, thyme, chives, basil and garden sage was added to the patio along with pots of rosemary, lemon balm and chocolate mint. Other pots on the patio hold cherry tomatoes and vinca for a pop of color. The vegetables and herbs will be used in preparing the residents’ meals and the herbs can be also be enjoyed just for their scents. 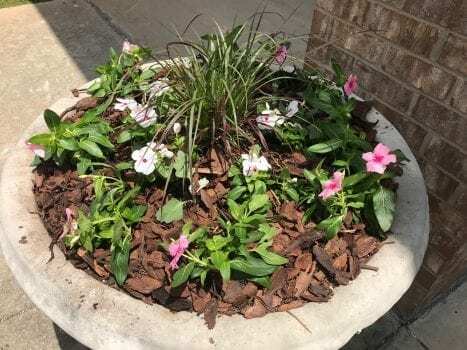 This project enhanced the entrance, front porch and the back patio of The Gardens of Clanton and will be enjoyed by the residents and visitors alike. 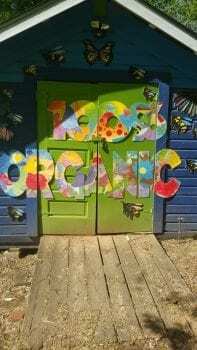 Thanks to Audrey Giles and Trisha Williams for implementing this project and thanks to both for donations of herbs. Thanks also to Alice Broome for the donation of the beautiful rosemary plant. 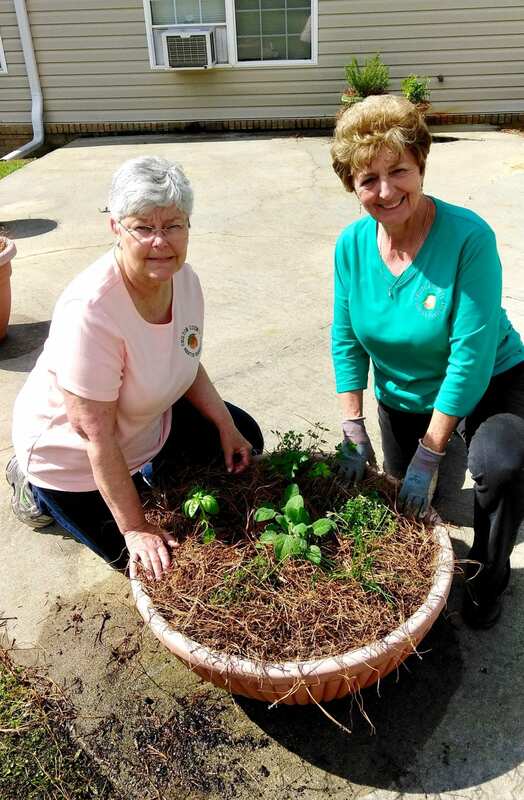 Chilton County Master Gardeners toured the University of Montevallo Community Garden on April 17. The director of the garden, Holly Wadleigh, told us that volunteers and UM students plant, maintain and harvest the vegetables grown in the garden and donate them to Shelby Emergency Center. 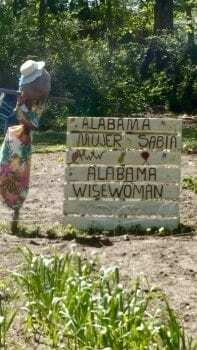 In addition to growing vegetables for SEC the garden hosts a Wise Women healthy living garden program and also rents garden plots to individuals. After a great lunch at Tavern on Main in Montevallo what gardener could resist a visit to Cedar Creek Nursery! 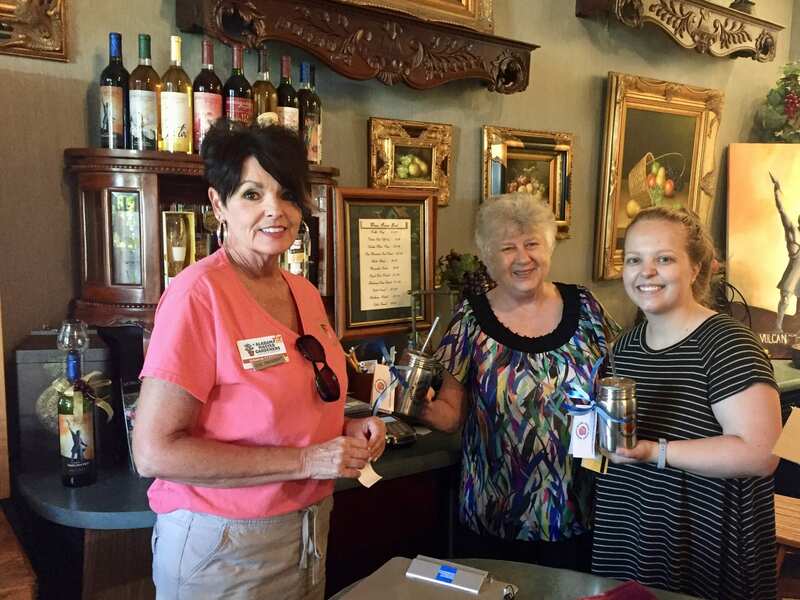 On April 11th, several of the Chilton County and Autauga County Master Gardeners made a trip to Prattville for a fun-filled touring day. Our first stop was the Bamboo Forest, which is located in Wilderness Park, 800 Upper Kingston Road and is owned by the City of Prattville. This is an amazing park, open from dawn to dusk everyday. Next on the list was the Demonstration Garden owned by the City of Prattville and located next to the library. 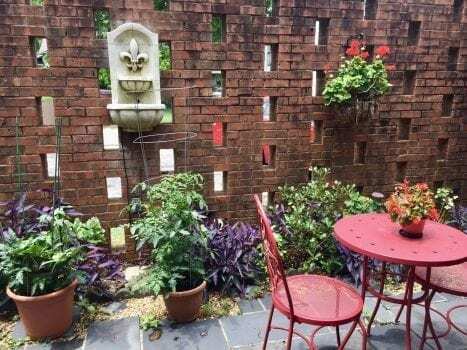 This garden is maintained by the Autauga County Master Gardeners. Many pounds of vegetables are grown and donated to area families each year. Our next stop was the Prattville Gardens in Old Prattvillage. There we saw beautiful sun and shade-loving plants, which are also maintained by the Autauga County Master Gardeners. There is also a lovely old chapel on the site. The Gardens can be reserved for special events. Last but not least was the beautiful home of Autauga County Master Gardeners Don and Glenda Armstrong, which sits on 12 acres about 6 miles out of Prattville. Don’s main hobby is landscaping around his house. He also loves to propagate plants for his own use and Autauga County M.G.’s annual plant sale. They also provided a wonderful salad lunch complete with homemade yeast rolls and dessert they prepared themselves. Our tour day was a huge success! HERE is a slideshow of photos from all our tours. Be patient as the music pauses, there’s MORE!